A new video from the private spaceflight company Blue Origin shows a simulation of passengers taking a ride into suborbital space aboard one of the company's vehicles. A video released last week by the private spaceflight company Blue Origin offers a tantalizing look at the private space trips the company plans to offer. The two-minute Blue Origin video features Jeff Ashby, the company's chief of mission assurance and a former NASA astronaut, describing what the private trips will be like, as well as the life-changing experience of going to space. 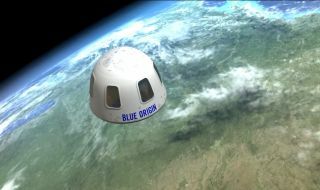 The video also features a computer animation showing passengers floating weightless inside the rather roomy Blue Origin space capsule, and staring out its wide windows when they reach suborbital altitudes above the Earth. Blue Origin was founded by billionaire and Amazon.com CEO Jeff Bezos. In April, the company performed a test flight of its suborbital New Shepard spaceship, which includes a six-passenger crew capsule. The somewhat secretive company did not announce the specific date of the launch until the test was already complete. The new video also features Nicholas Patrick, a human integration architect for Blue Origin and a former NASA mission specialist. Patrick also speaks to the tremendously awe-inspiring experience of traveling to such high altitudes above Earth. "When you first look out through these massive windows, you just lose yourself in a panorama of blue and black," Patrick said. "You can see clearly for millions of light-years in every direction. It gives you a sense of the scale of the universe." The private spaceflight company Blue Origin plans to offer private trips into suborbital space aboard rather roomy crew capsules with large windows. On the experience of weightlessness, Patrick said, "It opens up possibilities for movement that you've just never had here on Earth. It's a shared experience with your crew, but it's also profoundly personal. So you really feel a part of the unfathomable depths of the cosmos." Blue Origin has not said when commercial flights aboard the New Shepard spacecraft will be available or how much they will cost, but interested parties can fill out an information form on the company website to receive "early access to pricing information and tickets when we open reservations."